Monica with her new Canon T3 during our DSLR Photography Lesson in downtown St. Petersburg North Straub ParkMonica's parents bought her a 2-hour DSLR Photography Lesson gift certificate for Christmas which she used for our first lesson this evening. She has a Canon T3 along with a trio of lenses: Canon 18-55mm, Canon 55-250mm, Canon 50mm f/1.8. 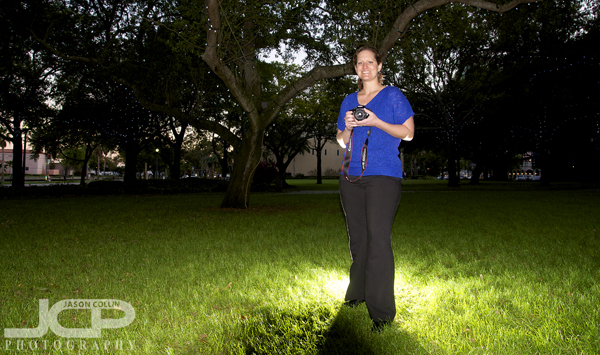 We had a chance to practice using all three during our lesson in donwtown St. Petersburg, along with her tripod. Monica had a lot of photography knowledge already from self-study, reading photography websites, etc. During our lesson I helped her organize that knowledge into practical ways of making a variety of different photographs from single subject shallow depth of focus images to bird-in-flight shots to natural light golden hour portraits. Our lesson was for sure one of the most information and gear packed 2-hours I have ever taught! We ended the lesson using her Canon T3 on her tripod to make light trail shots of the little traffic that cruises down Beach Drive on a Monday night. I expect Monica to be able to quickly build on all we covered in our first lesson and begin to be able to "self-teach" herself. I look forward to seeing the results.